Is it any wonder GoDaddy.com is the largest domain registrar? Today I received the following email offer from Network Solutions after I had already bought my domain names for the day from GoDaddy. 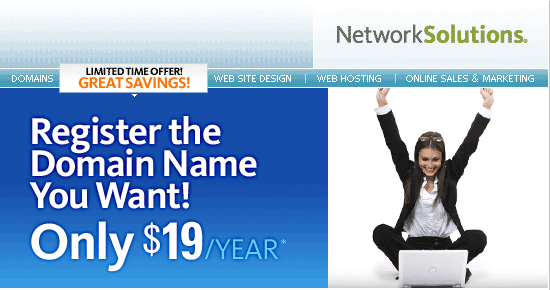 I am sure there are compelling reasons to pay twice as much to register your domains at Network Solutions than at GoDaddy. Since Network Solutions hasn’t been able to convey to me exactly what those reasons are, I will continue to register my domains with GoDaddy. This entry was posted on June 21, 2007 at 9:31 pm and is filed under Domain, GoDaddy.com, Network Solutions, Registrar. You can follow any responses to this entry through the RSS 2.0 feed. You can leave a response, or trackback from your own site.